From the emails I have received, it seems that many of you enjoyed yesterdays post. Thanks for writing to me! So today is part two, and I am willing to bet that you will be able to pin point much easier what it is that elevates these bedrooms to the next level. Here we go. 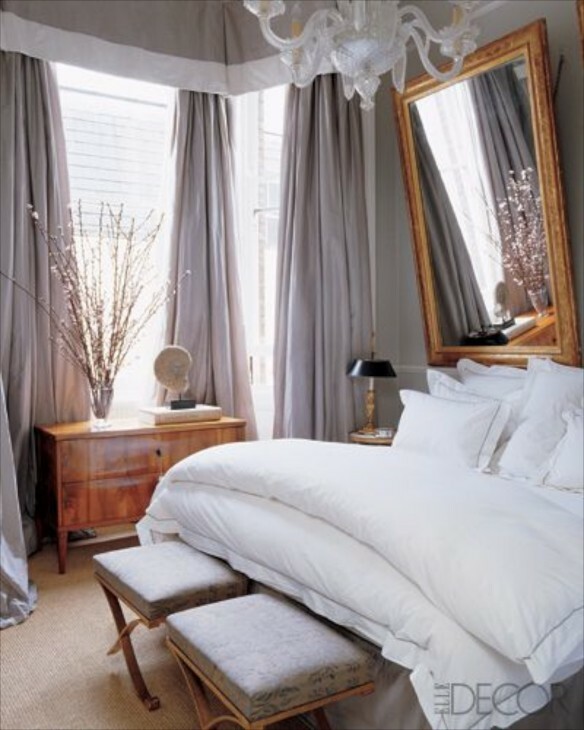 This bedroom has wonderful classic architectural details. The floors are stained dark and even without a small area rug seems finished. 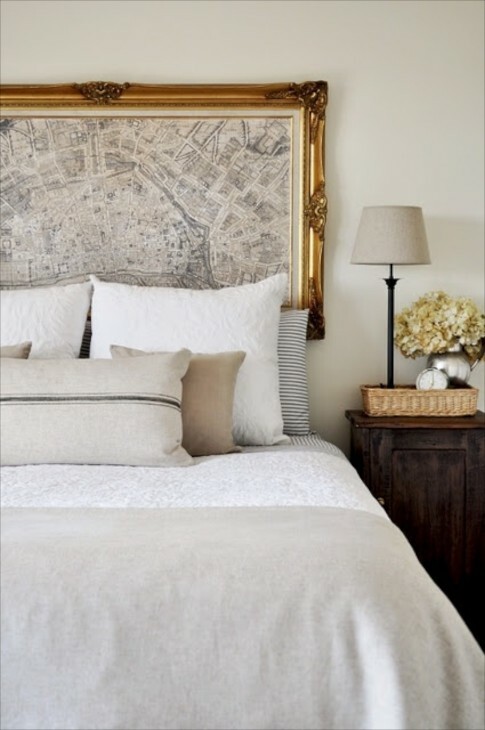 Even if you take away the pilasters in the corners this room would not have the sophistication without the wall of framed maps above the bed. They balance out the height of the rooms walls, and the simple thin frames knock it up a bit. Notice that the frames even extend below the level of the mattress. Nice room with nice details. Your eye can find these details, like the table, unique lights and textiles patterns and colors because the designer choose white for everything. The same white appears on the walls and trim, so the eye will go directly to the bed area. The choice of this white also keeps the room bright. 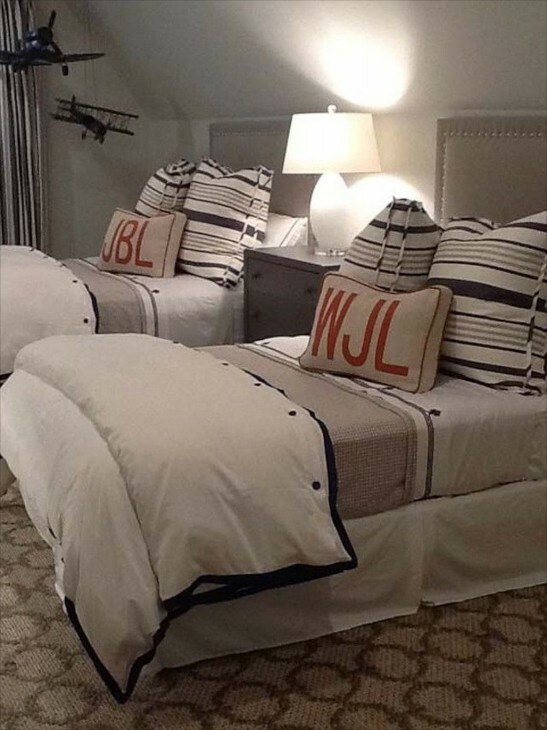 I like the choice of the patterned natural fiber carpet, and the hanging airplane models, but like an example we saw yesterday, it is the initial pillows with the pop of color, in this instance red, that puts the room all together. Try and visualize the initials in black or beige, and the effect is lost. Other primary colors would work. This one is a little tougher! 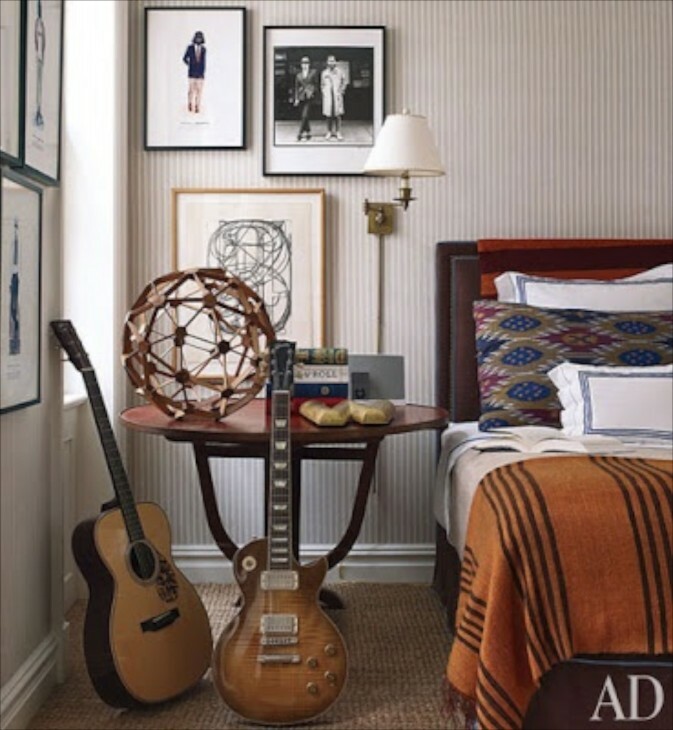 In this room there are many possible inspiration pieces….the carpet, the art, the basket, the lamp, i.e. to guide the direction that the room develop. At first I thought the bed, but in my mind I visualized several beds that might also work as well. 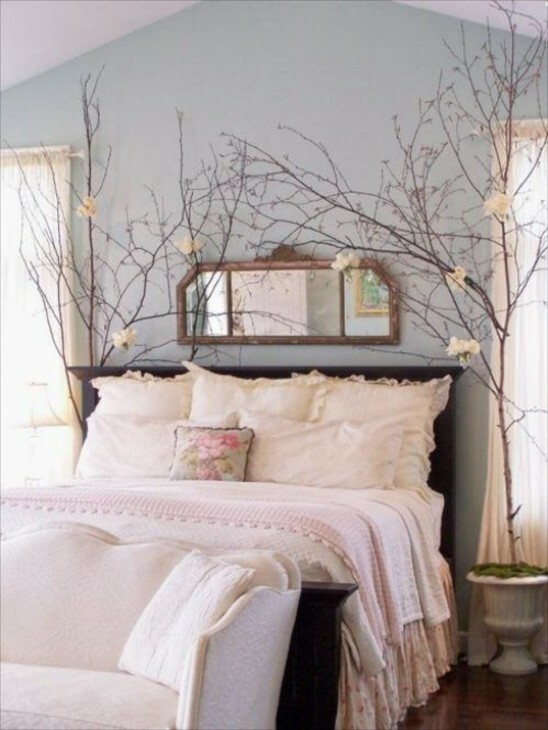 I decided that it was the choice of mirror – the shape, the antique patina, placement, and the fact that it reflects the colors we see on the bed, in the art, etc. Without the mirror, it wouldn’t feel the same. 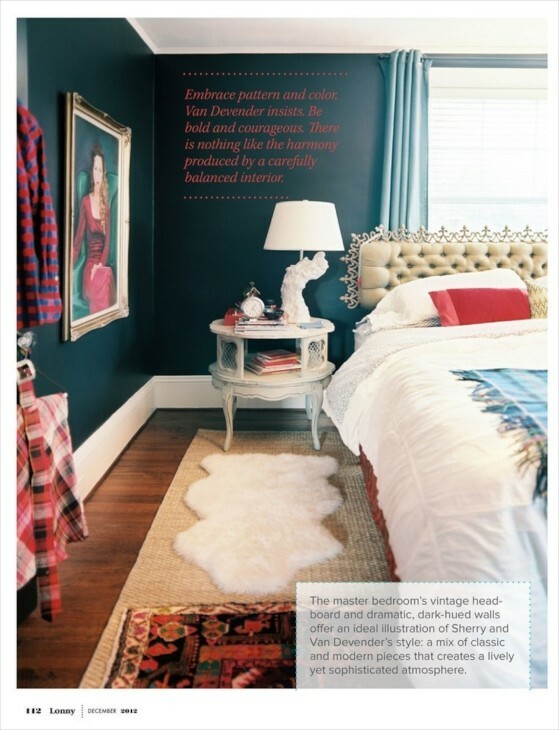 This was a tough one because the room is beautifully layered and a great example of all the pieces, colors, walls and floors, coming together almost as equal partners to produce the wow. Purple and magenta will do that! 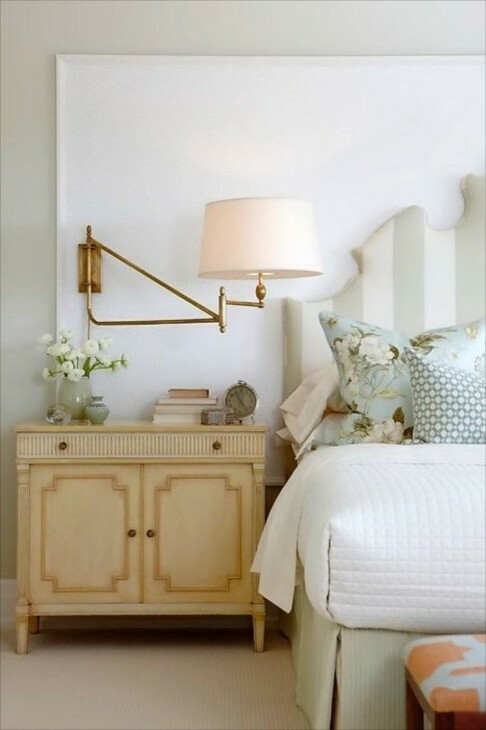 Adorable tiny chandelier, that also picks up the turquoise color in other parts of the room, but for me it is the choice of the turquoise blue and white bed shirt on this daybed. 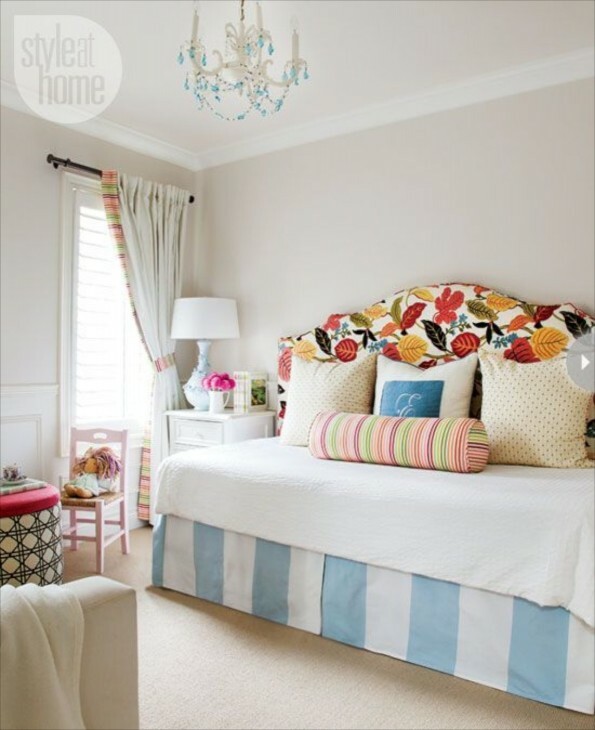 It has just the right scale in the size of the stripes and the blue picks up and draws attention to the blue in the floral headboard, the initial pillow and the ceiling chandelier. There is also just a tiny amount on the bedside lamp. Beautifully balanced. OK, I know all of you will get this one…….yes, the perfectly scaled wallpaper. 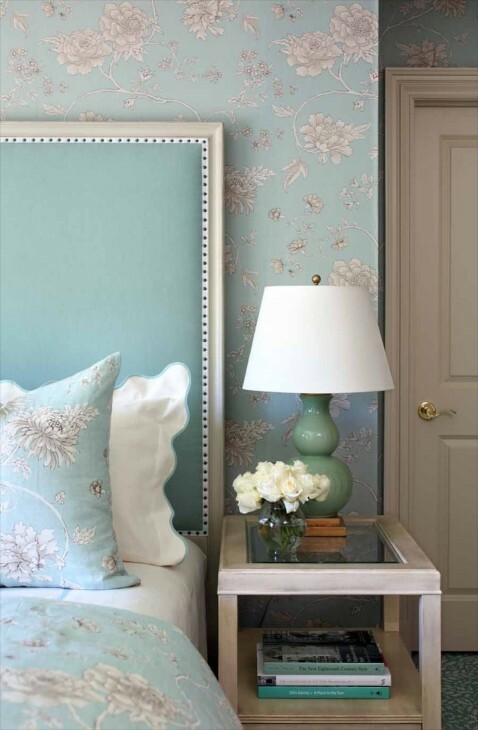 This bedroom is beautifully layered and constructed, but the wallpaper elevates it to very special. Interesting room. I like the choice of carpet, because the border is patterned and ties the wall and fabric colors together, but if you said the green cannonball bed, you were right. 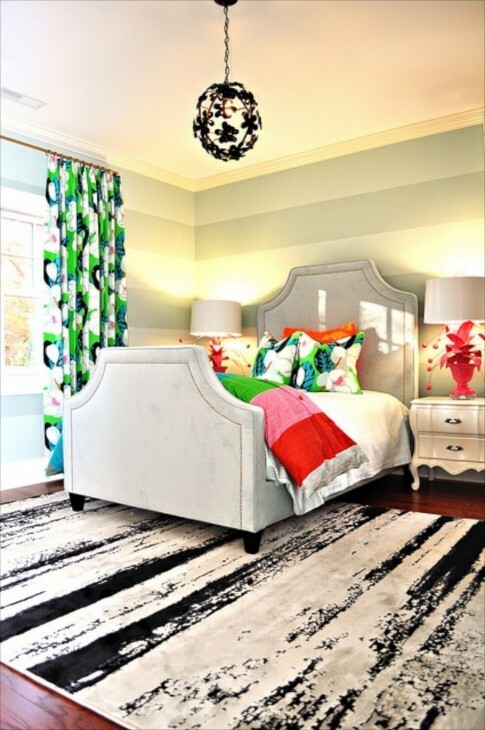 Lots of patterns here, but by varying the scale and staying with just a few colors, you can mix and match easily. I also have to say the choice of lamps with a touch of blue provides a welcome pouch of another color the room needs. 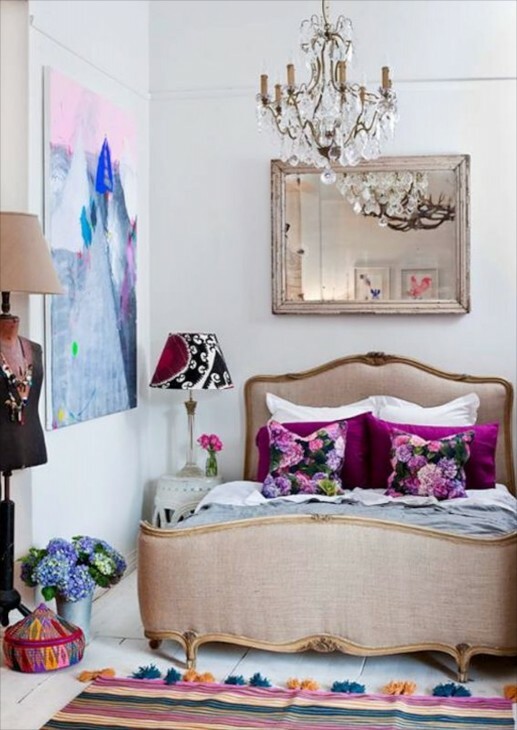 Although this is not necessarily my style, I have to say I love this bedroom! I went around the room covering up everything and the one, that if missing, would change to TOTAL overall effect THE MOST, is the horizontal stripes on the walls. And it is not just the strips themselves, but the color choices, which pick up the head and footboard colors. But if any of you picked the bold prints, or the rug, or the lamp, I wouldn’t argue. 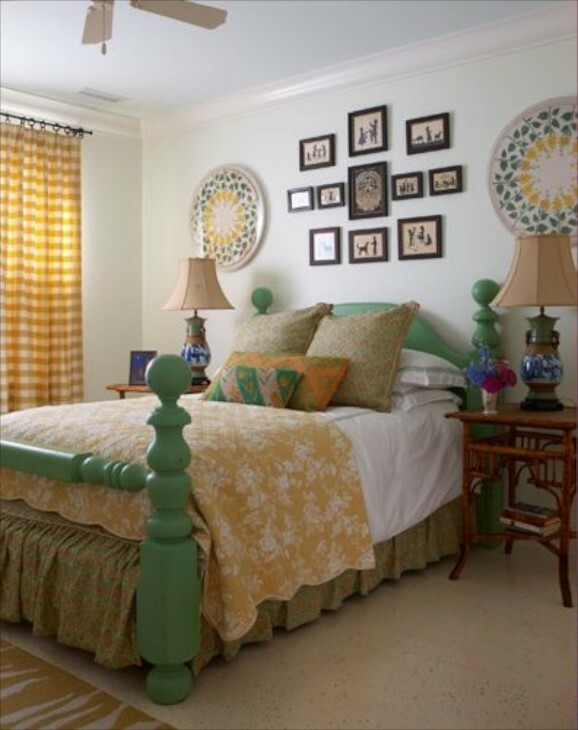 Some rooms have many elements that combined make the room special….especially when working with bold and patterned bright colors. The bed itself looks beautiful but is pretty covered up. I feel that the yellow nightstand adds not just a pop of color, but the bamboo style is a nice foil to the bed. I would like the mirror in this room a whole lot better if it was hung better so that it was flater against the wall. For me, the duvet cover in a non textured white color, the all bright white layering of the bed makes the room. A flat bedspread wouldn’t cut it. With all that loft in the quilt under the duvet cover, one would walk into this room, with it’s elegance, and just want to fall away onto the bed and pull those covers up and over your head. For all its elegance and sophistication, it is still welcoming, a sometimes difficult balance to achieve. 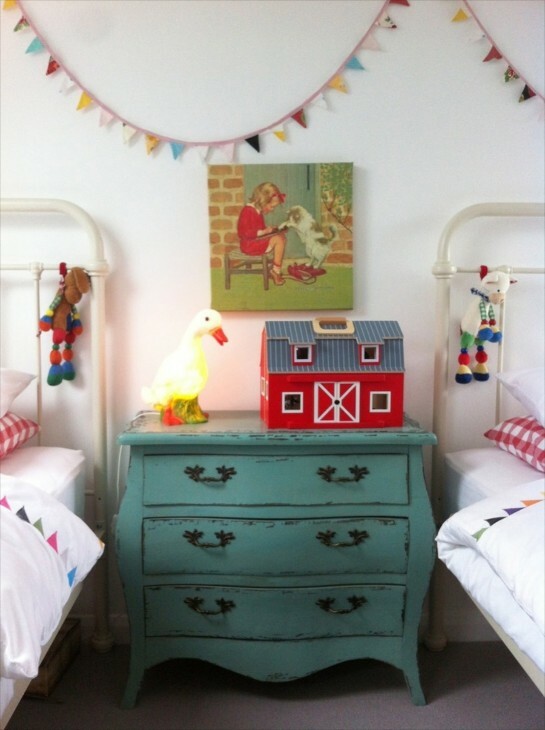 In particular, three pieces of art over the bed pull the room together – the little red square frame to the right and the frame to the left with the red bus, and again on the right, the framed bird with the red tipped wings. The other art has traces of red as well, and it is this subtle accent that allows the mismatched frames to work. The trees! The touch of green moss in the containers picks up the green on the single needlepoint pillow. Lots of terrific and interesting elements in this room, but I would have to go with the wallpaper. The strip there is repeated in the blanket and the natural fiber carpet. I like how the art was offset into the corner of the room. At first glance you might think the gorgeous swinging light. 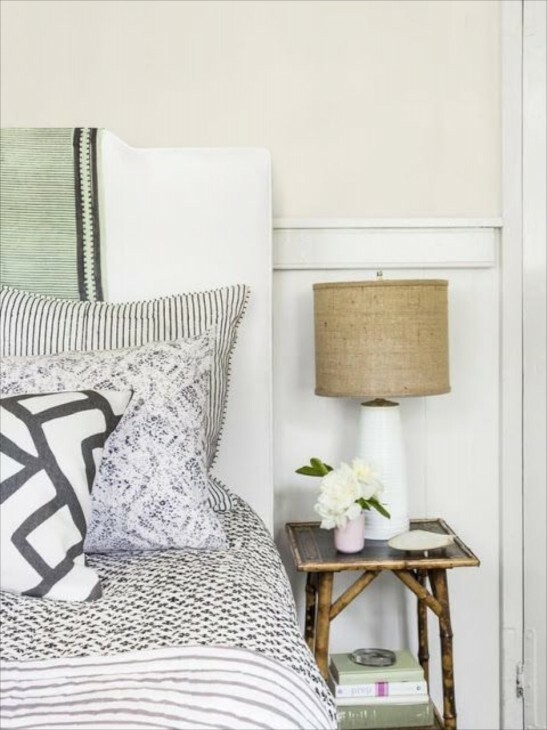 Look again…..the designer cleverly broke up the large expanse of green wall color by tacking a narrow moulding in a rectangle behind the bed and nightstand and painting it white. It is not too often that a pop of color in a room is white! The used brick wall adds incredible character and texture. Brick like this is one of those design elements that almost makes decorating easy. The dark walls for sure. The birch patterned wallpaper on just the dormer wall lends some visual weight without being as heavy as additional wood boards would make it, and much more interest than another vanilla wall. The string of flags. Adorable room. Like yesterday, an all white room. But here they used the same pattern, just in different colors. 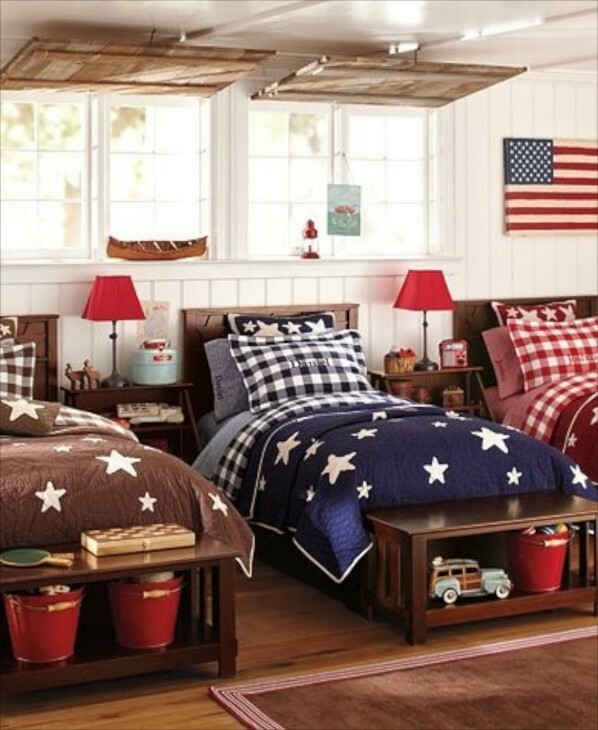 What kid wouldn’t love sleeping here? I bet you all are getting good at this now. 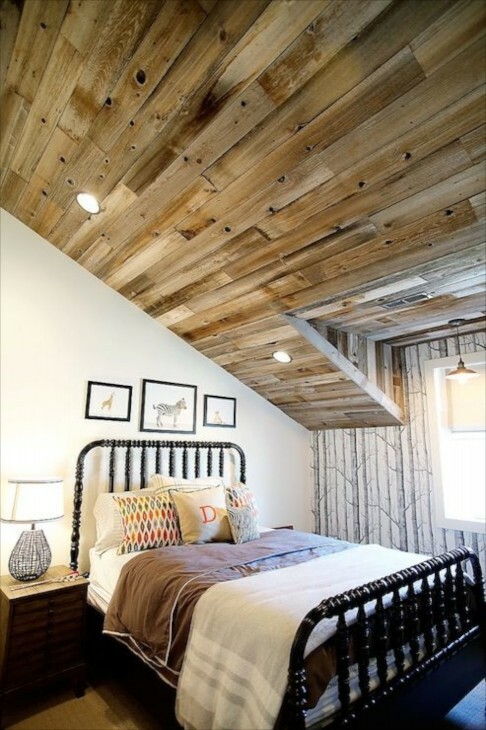 Here they did not just frame the recess with timbers like on the ceiling, but softened it by infilling with a softly neutral fabric and tufting it. The color choice is perfection. I just love these beds. We had one on a porch and it was always in use. However cool the beds are, here again the wallpaper choice pushes it up a big notch. The stripe mimics the line the rope makes from ceiling to bed, and I feel actually makes the braid in the rope pop more. Again, the wall treatment with 3/4 in orange and 1/4 cream. Hanging the art partly over the line where the two colors meet adds so much more interest. The art hanging on the shutters. 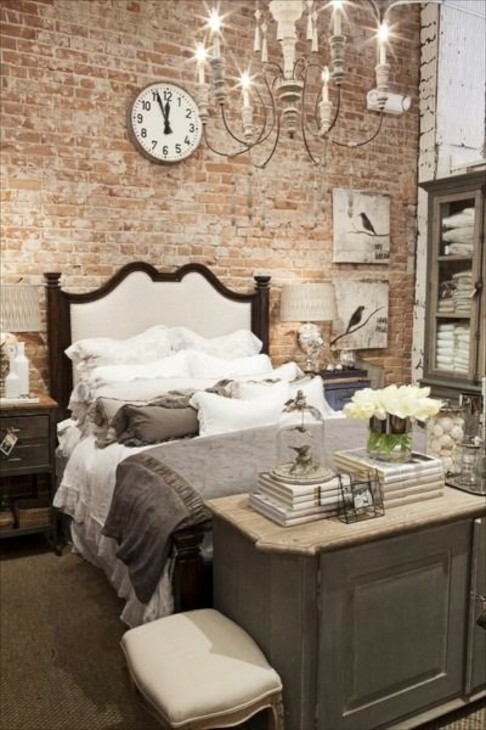 The bench at the end of the bed draws your eye back to the brick walls arch over the head of the bed. 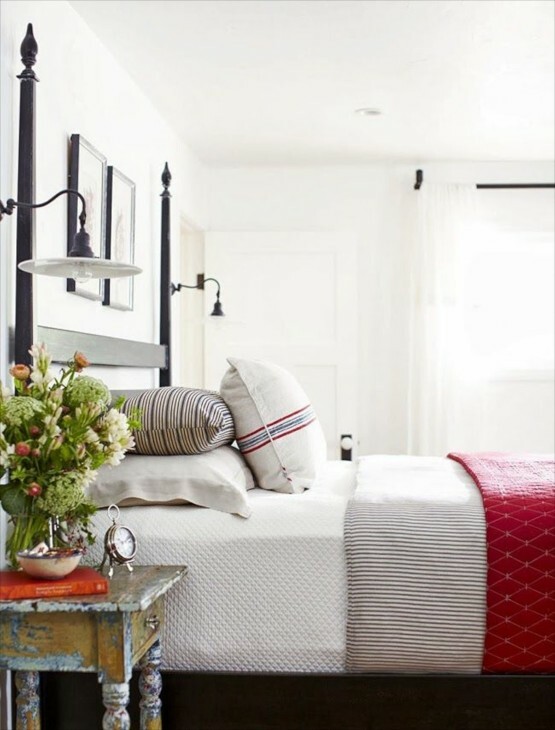 The chevron stripped coverlet at the end of the bed. The black framed art over the bed. Recalls the outline in the duvet cover. The only thing I might have done is switch the far right framed art on the right to the middle and the middle one to the far left, and the one on the left to the far right. I think it would balance better considering the silver and black rectangular frame on the night stand. The greens and balck accent on the headboard. 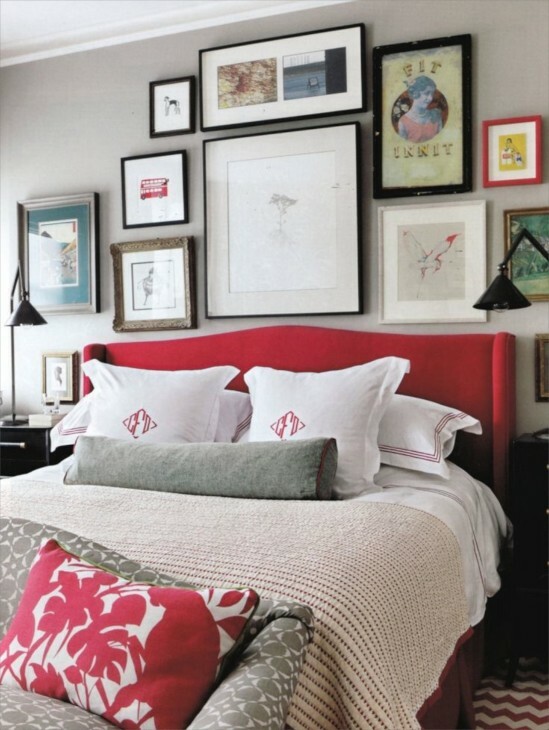 If the headboard were plain right it would be boring without some color on the top back wall. So unexpected…the butterfly paper sculpture. 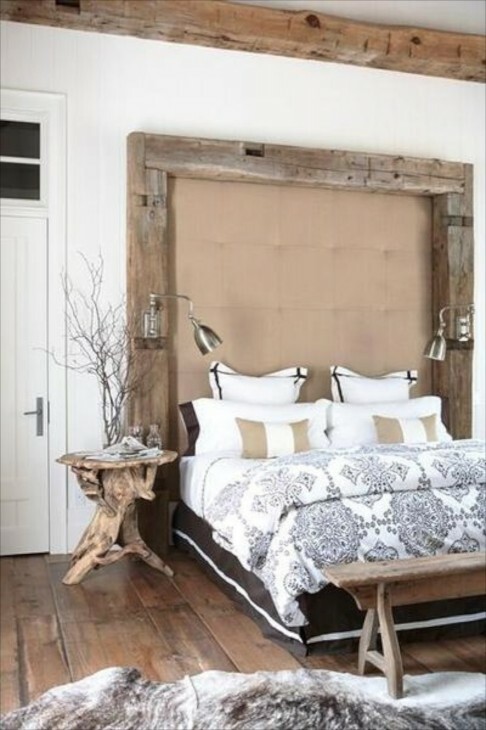 If you picked the nailhead enhanced white trim around the headboard…….you got it! A huge difference in the overall effect. Hi Charisse! I love these examples of what “makes” a room. 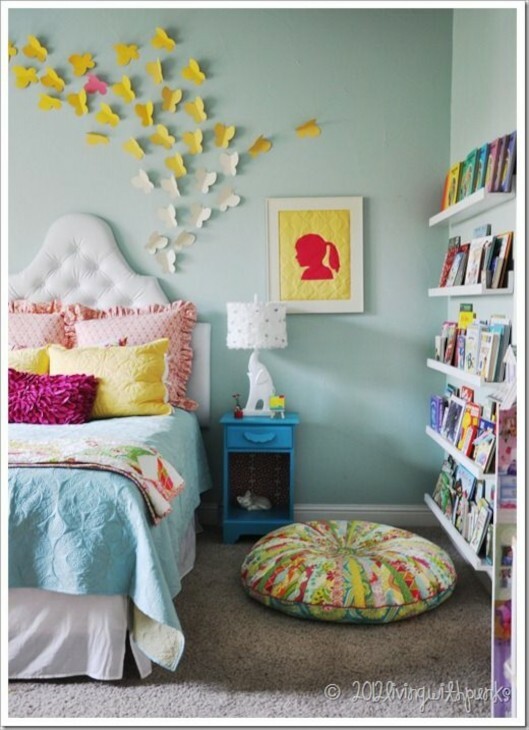 I have bedding similar to that in the first photo. 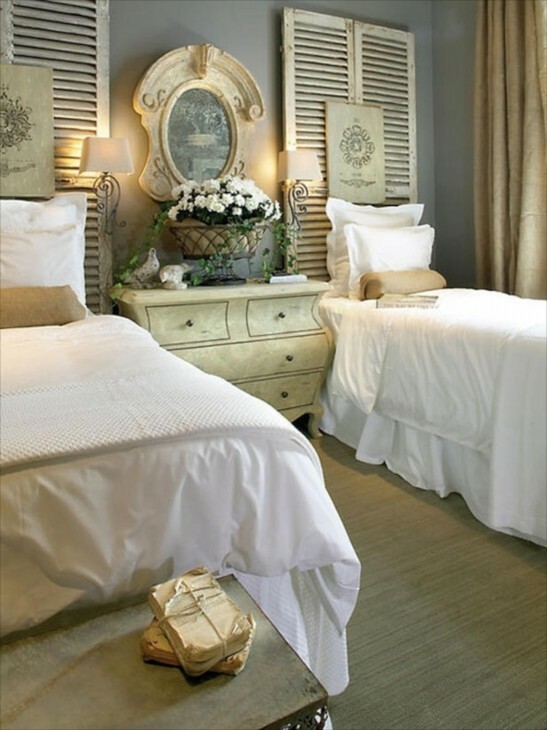 I’m torn between a antique brass bed or an upholstered bed. What do you think would compliment the style best? I would love your take on it. Thank you for your advice. It was my first choice but then I second guessed myself. I’ve asked Pottery Barn to send me a sample of their linen fabric to check on undertones. I’ll send before & after if you like once it’s all put together. In love with so many of the designs, I wish I could switch my bedroom out each year! I’m with you on the extra comforter. 8 degrees in Georgia, really! 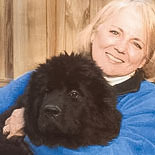 A wonderful blog, thanks for another enjoyable morning. My bedroom thanks to you Charisse is as pretty as any of these. We just love our bedroom. Buddy gives tours whenever he can! Makes me want to go back to bed now!! !